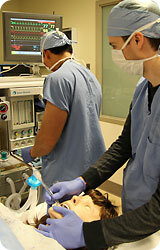 The University of Washington offers 26 categorical anesthesia residency positions. The categorical year rotations are linked to internal medicine and surgery programs at the UW and are in compliance with the RRC requirements for the anesthesiology clinical base year. Residents spend time in critical care rotations, emergency medicine, hospital medicine, cardiology, pulmonology, otolaryngology, pediatrics, gynecological and neurosurgery as well as a 4 week rotation in anesthesiology and a self-designed elective month. Residents enter the CA 1 training after successfully completing a clinical base year which must include at least 6 months experience in caring for inpatients in internal medicine, pediatrics, surgery, or any of the surgical specialties, obstetrics and gynecology, neurology, family medicine, or any combination of these. In addition, there should be rotations in critical care and emergency medicine of at least one month duration and no more than 2 months each. During the first year of training anesthesia residents rotate through the general operating room rotations at the three major hospitals, University of Washington Medical Center (UW), Harborview Medical Center (HMC) and Veterans'; Affairs Puget Sound Health Care System (VA). 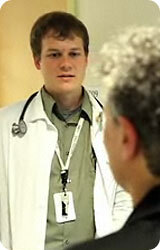 Residents acquire a broad spectrum of experience at the three hospitals. 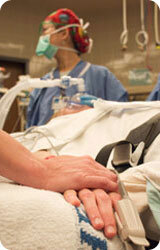 At HMC the major focus is on trauma, orthopedics and neurosurgical procedures. At UW cases are more elective in nature and cover a range of specialties including general surgery, bariatric surgery, otolaryngology, gynecological and orthopedic surgery as well as being a major center for cancer surgery. The UW is a major center for organ transplantation, performing in excess of 120 liver transplantations per year, and for complex cardiothoracic procedures. We are also a specialist referral center for high risk obstetrics. The new surgical pavilion offers residents extensive experience in ambulatory surgery. At the VA hospital residents care for our veterans who are suffering from a spectrum of cardiac and vascular diseases. In the latter 6 months of the CA 1 year residents rotate through 2 months of acute and chronic pain rotations or one to two months in the ICUs. Critical care training is provided by a predominately anesthesiology based faculty who are certified in both anesthesiology and critical care medicine. During the CA1 year all residents undertake a 2 week rotation in the post anesthesia care unit (PACU) where they learn how to care for patients in the immediate post-operative period. During this rotation residents also participate in the continuous quality improvement process, learning about systems issues and how to recognize and manage the complications related to anesthesia. In the third year the residency training is more flexible, allowing each resident a certain amount of flexibility to tailor their rotations to their own interests. All residents are required to take rotations in pediatric anesthesia, neuroanesthesia,cardiac anesthesia and a senior ICU month. The residents may then select their remaining months of training from the following list of specialty rotations. Research projects, preparing case reports and presentations for local and national conferences.